The works in 40° West: Explorations of a Dignified Lonely person tend to focus on a number of themes. These themes are general areas of interest I use to focus my observations for composition and subject matter. I think about landscapes as shapes and blocks of contrast and color. Compositionally I have always implemented negative space in designs in both photography and traditional medium. For me the sky is significant, and to leave room for it is comforting. Contrary to traditional landscape photography I often shoot with a wide aperture. In conjunction with compositional use of negative space, shallow depth of field helps to focus attention on specific areas of interest within the scene. Upon making my way to the Pacific Northwest, I began to recognize the amount of character present in individual trees. I have always appreciated the shapes created by barren branches in the winter months back east, but in the Northwest, forest composition and dynamics do not lend themselves to the same structures. Instead temperate climate and dense forests create an understory in which individual trunks or sometimes stumps stand out. At a certain point in my explorations I began to feel that with enough time I could learn to recognize individual trees simply by their trunks. Each has a unique shape, catches light in a particular way, and has it's own specific coating of moss, lichen, ferns, or other plants that it supports. Together these various elements create what I feel is a unique set of characteristics. Beyond individual trunks and compositional elements, these photos tell the story of forest management and extremes in outcomes for individuals based on where and when they happen to exist. Trees here can be exceptionally long lived and grow to tremendous size. The properties inherent in old growth redwood also ensure that a stump may persist well into the future, perhaps a century or more. The significance of these old growth forests can be seen in the uniqueness of ecosystems, in many instances the trees do not simply grow in the environment, they are the environment. When and where become significant when current geography and history are examined. Today only 2% of the old growth redwood forests still exist. Historically speaking ease of extraction was a big indicator of whether a tree would continue to grow until it fell of natural causes or was taken by a saw, the trees that could be taken and transported easily are gone. 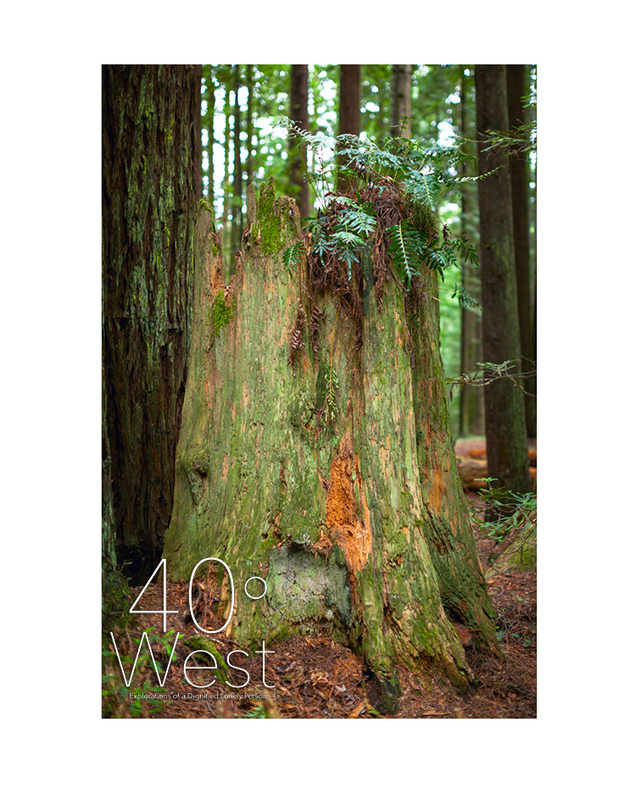 Today the remnant 2% of old growth redwoods are located almost entirely in Humboldt and Del Norte Counties. Trees, lucky enough to have sprouted in what is now National Park lands will be able to continue on natures terms, the rest, located in on private or managed lands will likely be converted to stumps prematurely. Symbolically I enjoy documenting pathways both developed and undeveloped. Like many other creatures, we tend to take the path of least resistance. Over time cows form paths through meadows and migrating animals form trails between resources. In the animal kingdom survival is the intention and the paths come to exist through repeated use of the easiest or most apparent way. Humans often use pathways with the same intent, roads connect cities and towns, they connect areas of habitation with areas of industry and resources. Today the formation of pathways in the human world is not happenstance, they are engineered. Both highways and hiking paths have come to be through the process of land survey and human manipulation of the very earth they spans. Human pathways are intentional, and purpose built, they age and weather, they develop lore and cultural significance. Pathways connect us to other worlds of possibility, in most instances pathways are the vehicle to discover what is around the next corner. For me pathways have always been about discovery, without a path how do you get there, how do you return? To follow a pathway is to know that others have gone, that the way is safe, that you will arrive somewhere, and that others have found value in going there too. I have been interested in documenting people in natural places for quite some time. In many ways it seems more honest. As anyone who has visited the Yosemite Valley, The Great Smokey Mountains, Yellowstone, or other National Parks may have observed, people fill the landscape. Indeed it's a rare occurrence to encounter many scenic overlooks without a group already taking selfies and snapshots. Even in snapshots, most strive to romanticize scenes by waiting for bystanders to move, pushing forward to the front, or asking people to move out of the frame. Over the years I have made a point to include people in the frame. I often focus on groups as the subject. To me placing on lookers between the lens and the scenery more honestly documents the experience of visiting many of these areas of beauty. The process here in Humboldt is somewhat different, people here tend to have more intimate interactions with the environment. Rather than looking out at it, people interact with it, becoming part of the landscape rather than an element between the landscape and lens. It's where people meet friends, clear their heads, go to recharge, for many, Humboldt's outdoors are an extension of home. As a new comer I spent hours exploring on my own, an outsider observing interactions between friends and with the environment. Community and interaction is a fundamental part of the human experience, as a lone person in Humboldt, exploring the outdoors allowed me a window into the world of interactions that usually take place in enclosed spaces. In a strange twist these human interactions within nature are the romanticized version of the scene. To become familiar with something often implies observation and interaction. Upon my arrival in Humboldt I was amazed at the number of interesting plants and flowers that seemed to grow everywhere. Picked 'em Myself, was the first iteration of a broader theme. Initially I documented floral arrangements of plants I picked from wild areas in my neighborhood. As my explorations took me farther into Humboldt the project transitioned to documenting unique specimens I examined along the way, small creatures, leaves, and fungi among others. Growing up on the east coast I was always relatively close to the ocean. There is however a big difference between being able to ride a bicycle to the beach and driving 30 or more minutes to the shore. The beaches in Humboldt County are also spectacularly different. Though sandy beaches are often separated from the mainland by lagoons and other bodies of water, it is quite different from the barrier island dynamics of much of the Atlantic. 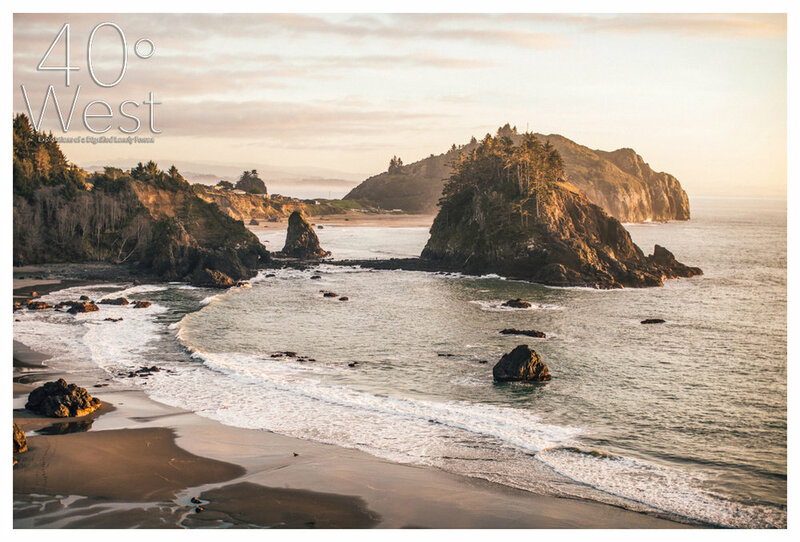 Humboldt beaches are also quite divers, comprised of light fine sand in one cove, pebbles in the next, and entirely jagged continental rocks in another. Beyond the natural differences, the built and human world surrounding these areas is in stark contrast with those in New Jersey. Where the mainland reaches the sea there are tall bluffs overlooking the ocean and the low population density and cooler weather do not lend themselves to costal communities outside of areas where a harbor or river may be beneficial to marine industry, because of this the dynamics of coastal communities do not tend to be tourism based, and much of the coast remains remote. The different dynamics of the coast coupled with my proximity has made exploring the coast one of my major focuses. During stormy weather the coast takes on a new dynamic. Waves pound offshore rocky islands sending up jets of mist from blow holes (vertical cavern formations in rock) high into the air. Storms often draw people to the coast. At the the north jetty people gather atop the dunes to watch 20 ft waves crash through the small opening to the bay. While in other areas surfers flock to sheltered coves to catch big waves. Having spent most of my life in New Jersey my view of what is normal in the world is certainly specific to my area of upbringing. Through the years I have taken opportunities to experience other regions of the country and the world. Each venture shapes my picture of the world a little bit at a time. Everywhere has it's own version of normal, from natural systems all the way to cultural and social norms. I have spent more time in Humboldt than anywhere other than South Jersey, Humboldt is spectacularly unique in both the natural and man made world. Explorations here always lead to discovery. New ways of thinking about social and cultural norms as well as discoveries about light and landscape. After nearly three years I still feel as though I'm a stranger in a weird and wonderful place. More discoveries await.